Trees are an integral and highly influential part of our landscape. They can have a profound effect on the character and feeling of a space and thus any pruning or removal needs to be carefully considered. A well cared for healthy tree can increase property values and make a place much more enjoyable to spend time in. -Tree Selection Make sure the trees you plant will be best for the space you have- not just for the next few years, but well into the future. Also known as “right tree, right place”. -Structural, Corrective, and Maintenance Pruning– It’s important for a young tree develop its main branches correctly. This leads to healthy structure as the tree grows, reducing the chance of branch failure later as well as reducing drastic and costly pruning down the road. -Tree Risk Assessments and Consultations– A thorough examination of your trees can detect problems and help ensure they continue to thrive while posing minimal risk to you and your property. I’m an ISA Certified Tree Risk Assessor (TRAQ Qualified). 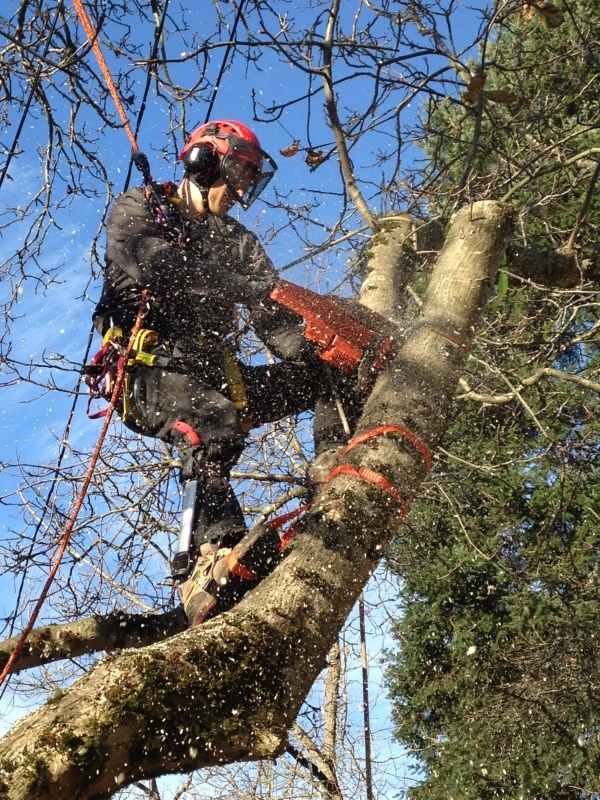 -Comprehensive Fruit Tree Care– I specialize in the care and pruning of fruit trees. A tree that produces tasty fruit can really enliven a yard. Don’t rule out a fruit tree just because you’re concerned about wasted or messy fallen fruit- there are several organizations in the Puget Sound that will come pick unwanted fruit and donate it to local food banks. It’s also possible through grafting to have only part of a tree fruit, leaving the rest ornamental. Grafting particular varieties can also stagger the ripening times so you’ll have a manageable amount of fruit over a longer season. I prefer to plant trees rather than cut them down. But for every tree that I do remove two will be planted in our National Forests through the Arbor Day Foundation, or I will personally plant two trees on a homestead in Skagit Valley, WA. Based in Wallingford, serving the Seattle area. 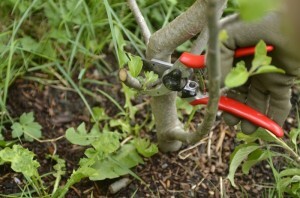 Most people prune when the tree is dormant (no leaves) because it is easier to see what and where you are cutting. But people often forget that dormant pruning has a stimulating effect on the tree. That means you are encouraging new growth the next growing season- most noticeably directly below where the cuts are made. This is very useful and desirable in many cases, but not all. Sometimes you may want to slow the growth of the tree. “I want to keep it small” I often hear people say- this is when summer pruning is called for. Summer pruning has a dwarfing effect, meaning you can control the shape and size of your tree (and thus where the fruit grows) without it sending up hundreds of water-sprouts (the vertical fast growing shoots) the next year, as it potentially would if pruned while dormant. The growing season is also a good time to prune especially vigorous young trees that may be getting too big for their space or producing fruit out of reach. Pruning in the summer can begin to stop the endless cycle of pruning out hundreds of water-sprouts and suckers every winter, only to have them come back in force the next year. I care about our air quality and neighborhood noise pollution- I minimize the use of gas powered tools. I’m currently focused on tree care- and only offering landscape consultations, plant species lists, and suggestions, -no installations. I approach each landscape as a whole interconnected system, not just individual plants or features. This allows a landscape to be designed or modified in a way that allows each part (plant, tree, sidewalk, house) to help support and add in a beneficial way to the other features around it. For example, a cement walkway leading to a house does not just serve to allow access from street to house, it also collects and channels rainwater and stores residual heat from a summer day into the night, keeping the air temperature nearby a little warmer. Noticing these interactions and taking advantage of their effects helps create a landscape that works more like an ecosystem, requiring less inputs of work and energy and providing a more stable, beautiful, and balanced landscape. Holistic Landscapes and Gardens – I look at your landscape as a whole interconnected unit, not just individual plants or features. Organic Practices – I use only organic fertilizers when necessary, and encourage beneficial insects by planting appropriate plants. Edible Landscapes – I create aesthetically pleasing landscapes that can also be a source of fresh fruit and other edibles. 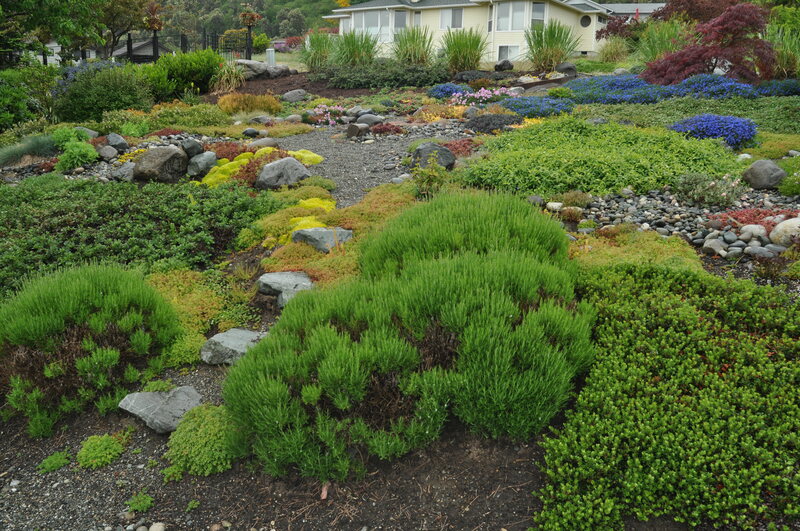 Multi-functional Landscapes – There are a multitude of functions a landscape can perform; provide privacy, shade a patio, filter rainwater, attract songbirds, and many more. Why shouldn’t the hedge or tree in your yard also provide you with some food or another useful product?